Zürs ranks among Austria′s most famous skiing and winter-sport towns, which - given the role that skiing plays in the country′s economy - means quite something. Surprisingly, Zürs is not a community in the adiminstrative sense of the word - legally, it is in fact a hamlet that is part of nearby Lech. 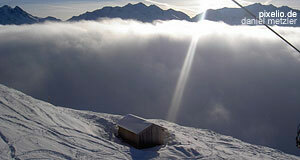 It is situated on the Vorarlberg part of the Arlberg Moutnain, but very close to the border to Tyrol. Zürs is situated on an extremely high altitude - for this reason, agriculture never played a particularly big role in the village′s economy. This probably favoured the development of the tourism industry in the formerly very remote settlement. Today, most of Zürs consists of luxury hotels and high-end tourism infrastructure. This is a relatively recent development, though. Until the very late 19th century, the population of Zürs was extremely poor. It consisted of a few pretty tough farmers, who were used to being cut off the rest of the World for several weeks every winter. In 1897, the Flexenstraße Street was built. This road granted a more reliable and more efficient connection between Zürs and other villages with real people. I assume this helped to get some fresh genes into the locals, too. A few years later, proper skiing arrived at the Arlberg. As soon as 1906, the first skiing classes are held in Zürs by the local hero and skiing pioneer Viktor Sohm. Shortly afterwards, a bunch of skiers from the Lake Constance or Bodensee region in Germany recognised the Arlberg′s great potential as a skiing resort - they attracted more Germans and the constant stream of Teutonic tourists hasn′t ceased ever since. The boom started just after WWI, when the first skiing schools were founded around 1924. In 1937, the first cable lift of Austria was built in Zürs. Every respectable hamlet needs a claim to fame, and this is the one of Zürs. The same year, the village built a fancy new church, designed by the local architect Hans Feßler and now famous as the "Christ-Königs-Kirche" of Zürs. In terms of entertainment, there are plenty of après-ski bars and nightclubs in Zürs and the surrounding towns. Lech is a good place for that, but somewhat snobbish. St. Anton is even more extreme in both of these disciplines. In any case, skiing is the main reasons why people come to Zürs at all - but hiking during the summers is a good idea, too. Not your usual kind of Zürs vacation, but scenic and at least you will see a less crowded Zürs than you would in winter. Attractions nearby include the other towns of the Arlberg region: Klösterle, Pettneu, the previously mentioned St. Anton, St. Christoph, Lech and Stuben. For a slightly further drive, go to Landeck or Imst. Days with bad weather might be well-spent in Tyrol′s capital Innsbruck.